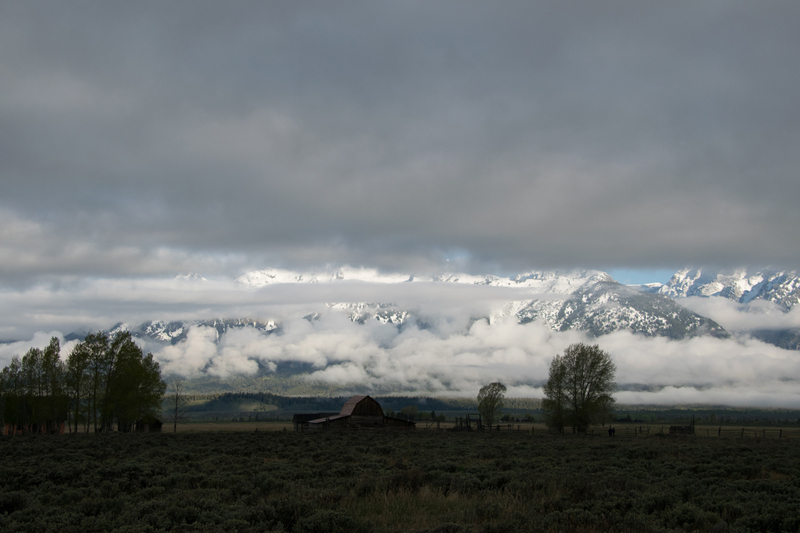 Tetons peaking out beyond the low clouds. When I awoke the sun was still down and the moon still shining brightly and low clouds clung to the sides of the mountains. Perfect conditions to drive the Teton Pass to Jackson Hole first time (she says sarcastically). If you haven't driven the Teton Pass then you should know much of it is a 10% grade and switchbacks. It was only mildly terrifying, mostly in the foggy areas. At one point, having cleared the low clouds, the moon was so bright it lit one side of the road as the sun, just coming up, lit the other. Snow still covered the ground at the highest elevations. Dawn. 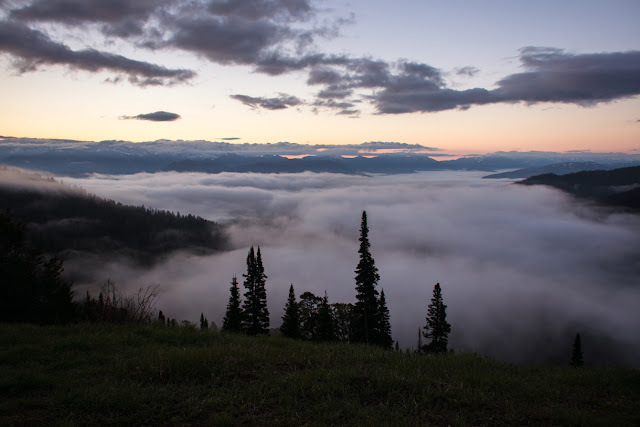 Jackson Hole is down below that cloud layer somewhere. 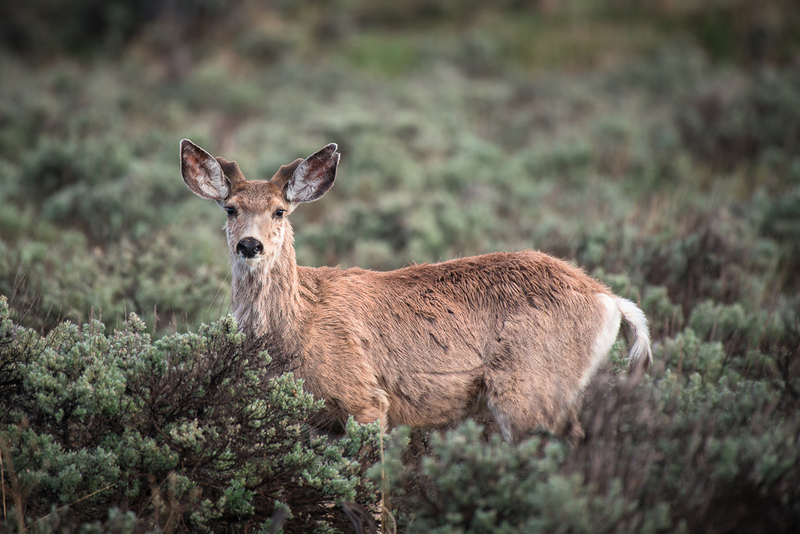 My destination was the parking lot for Jackson Hole Wildlife Safaris in Jackson, WY. I was doing a half day wildlife tour with them. I could have gone in search of wildlife on my own but at this point I needed a break from trying to drive, navigate, and photograph things all at the same time. 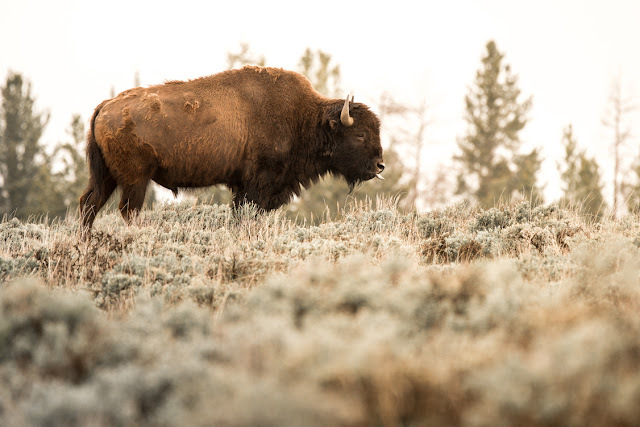 I have to compliment Jackson Hole Wildlife Safaris for bending over backwards to find a way for me, a solo traveler, to participate in a tour. Like many tours the world over they won't go out for one person (unless you pay for a private tour, which costs a lot more). They found another solo traveler to pair me up with and all was well. 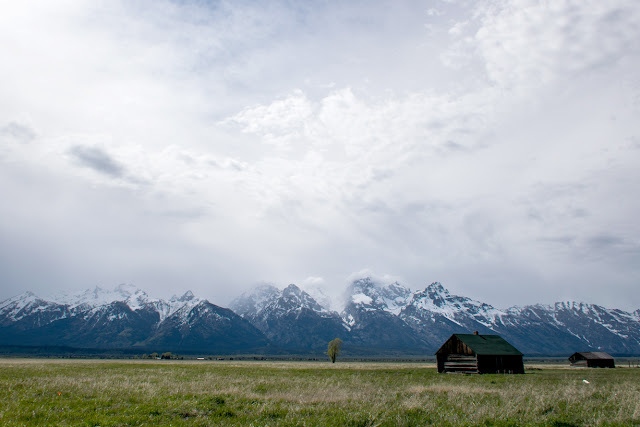 Jackson Hole is a valley between the Teton and Gros Ventre mountain ranges. It is the south entry into Grand Teton National Park. 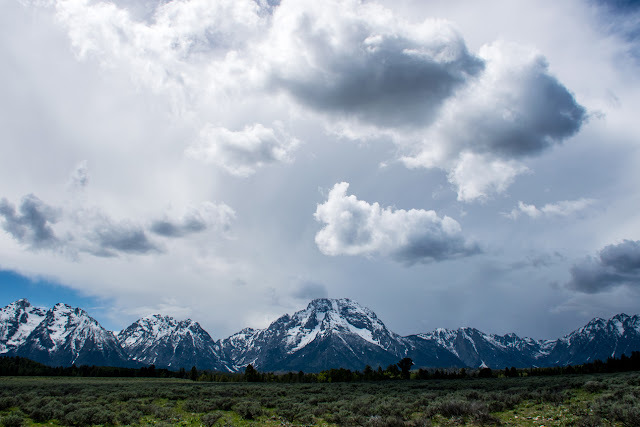 The Tetons are some of the youngest mountains in North America though they are made from rock that is nearly 2.5 million years old. Around 10 million years ago the Teton Fault ruptured causing the mountains to rise and the valley floor to drop. The vertical displacement between once contiguous layers is now 30,000 feet. Sculpted by glaciers and rivers the valley offers amazing views. Here you can explore alpine, forest, sagebrush flats, wet meadow, and lake and river environments. Here you can find more than 1200 species of plants, around 300 species of birds, more than 60 species of mammals, and 12 species of fish. This day the Tetons were moody, hiding behind clouds, peeping out, then getting lost in fog, and then getting stormy and mysterious. This gave varied photo opportunities to get the mountains in all their glory. 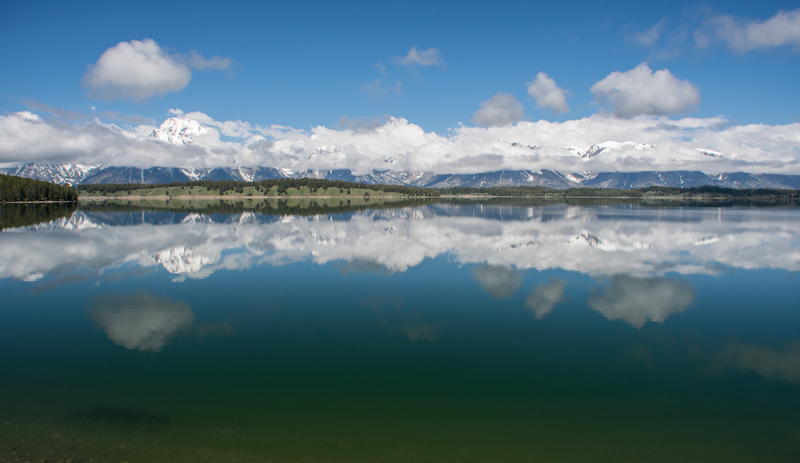 What you want to hope for is that Jackson lake, or one of the other bodies of water in the park, have no waves. Then you get amazing mirror like reflections of the mountains. The ubiquitous shot of the barn. 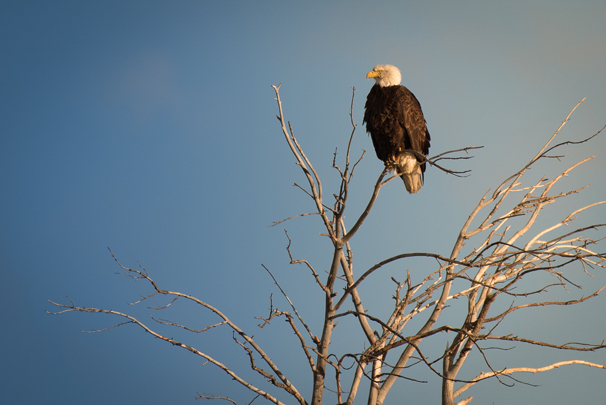 We first headed by the National Elk Refuge and observed a bald eagle nest. 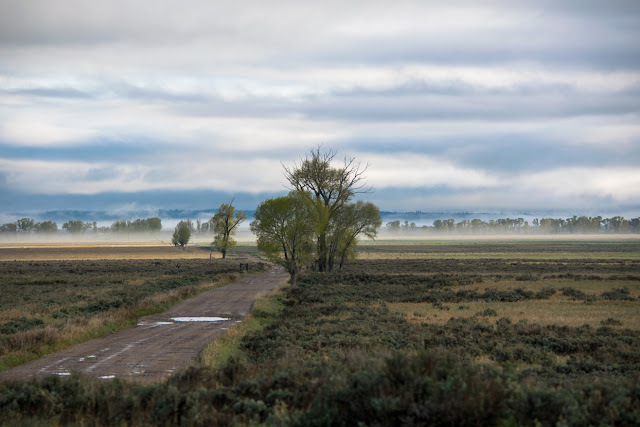 We then headed out toward Antelope Flats and out the Gros Ventre Road then back to Mormon Row. Here we saw pronghorn and elk in fairly large numbers. We saw more eagles and a lone mule deer. Harriers and red-tailed hawks were also out hunting and enjoying floating on thermals. 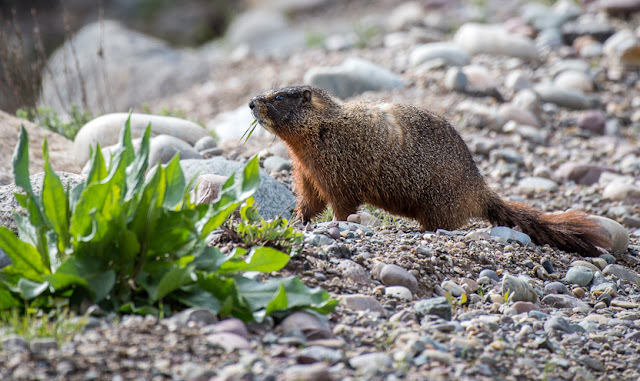 Then we headed north and encountered some buffalo and more elk and finally a whole family of yellow-bellied marmots. The marmots were a lot of fun to watch. One chewed on a rock. I found that interesting. Out on the lake were trumpeter swans, white pelicans and numerous waterfowl including mergansers and ring-necked ducks. A kingfisher hunted from above on a small pond out on the Gros Ventre Road. And over near Coulter Bay sandhill cranes wandered the sagebrush looking for a meal. We were constantly on the lookout for bear but had no luck this day. 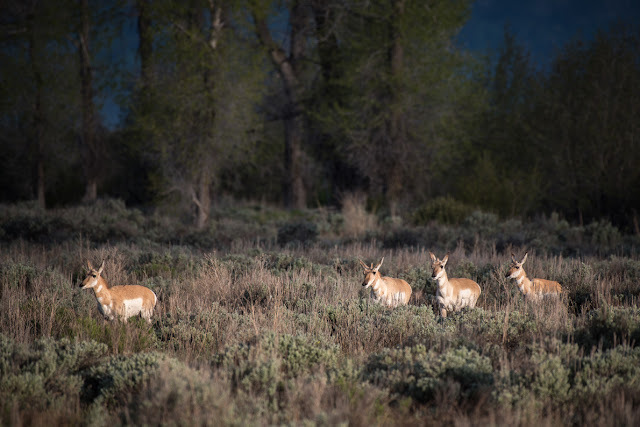 Pronghorn. In all there were eight individuals in this group. This was in late May and they had yet to drop their babies for this year. Bison with its tongue out. 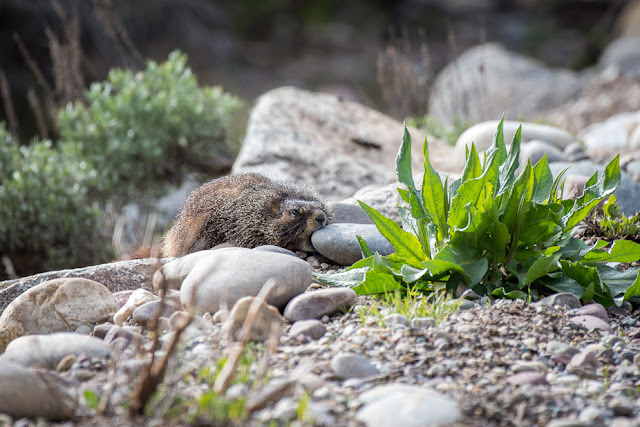 Yellow-bellied marmot biting a rock. I'm assuming it has to do with teeth size management but don't know that for sure. After the tour I went into Jackson and had lunch at Liberty Burger (really good local fair) and then wandered some galleries. 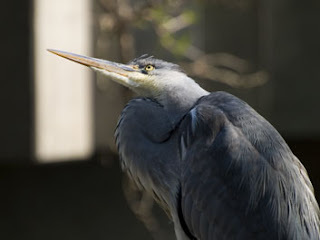 Then, as I waited for the afternoon light to get good, I visited the National Museum of Wildlife Art. This is a really nice little museum. I was really inspired by some of the pieces here. Be sure to check out some of the videos with the artists talking about the creation of some of their pieces. Then I went back into the park in search of wildlife. The bison and pronghorn came out in amazing numbers. Ravens flew above and around them. I just watched the spectacle for a while. 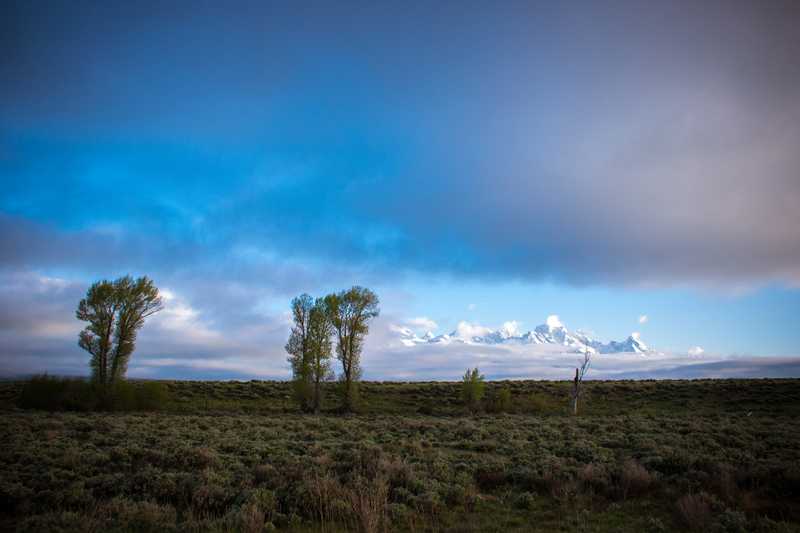 Mountain blue birds now darted through the sage brush flats, flashing blue in the dusky green. 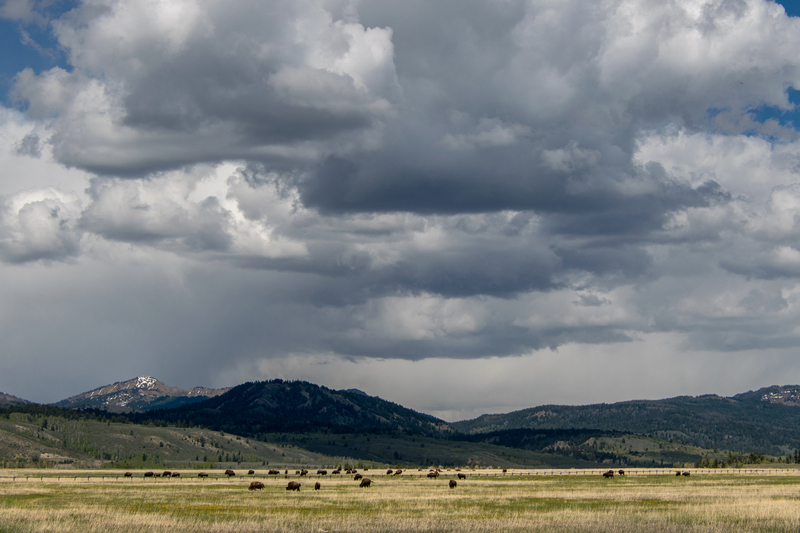 Then in got dark, very dark and storms started to come through and I fled back up the Teton Pass back to the safety of my cabin at Granite Creek Ranch, where the storms had already passed and I spent the late evening moose watching. Reflection in Jackson Lake. Taken just north of the Chapel of the Sacred Heart. This is not photoshopped. It really looked like this. Another shot at taking a shot near Mormon row. 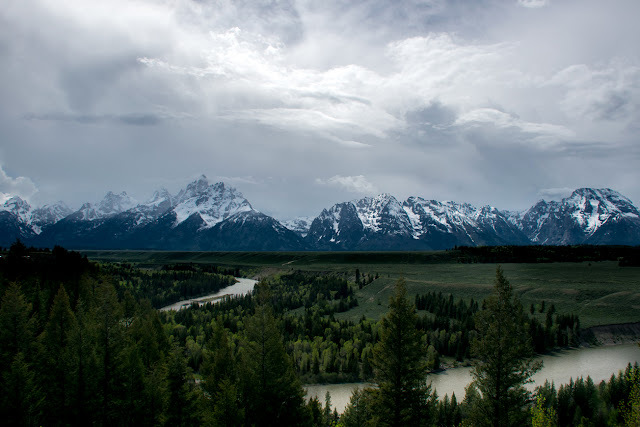 Snake River Overlook. My attempt to pay homage to Ansel Adams. I didn't quite get the angle right, nor am I any Ansel Adams by any means, but it was fun trying to attempt it. Brilliant photography, journalism, knowledge of wildlife...captivating writing..I look forward to every write you bring...you are amazing....thank you.